This building was erected by T.L. 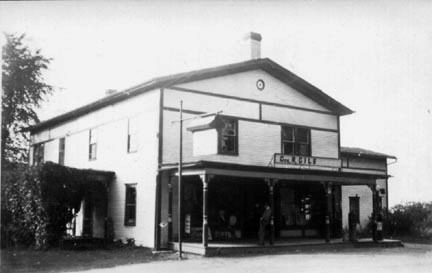 Bostwick in 1898, and in 1902, he established a grocery and shoe store in the front part of the building, which he operated in connection with his painting and cabinet making business until 1905. At that time, he closed the business to focus on the wooden toy and washboard business he had established in the former Universalist Church, now the Community Center, across the road. In May, 1914, Fletcher McGinnis bought the building from Irving Ballard and again started a grocery business. It was later sold to Marlin Bullock, who in turn sold it to Chester Potter in 1916. He sold to Frank Lawrence in October, 1919, who sold to Fred Bliss in October, 1921, and in March, 1923, the business was purchased by George Gile. He and his wife ran the store until his death in 1932, and she carried it on a short time thereafter. Robert and Lena Wilder Sharpley then bought the business and Lena carried it on many years after Robert’s death in 1935. In 1946, she married William Nichols, and together they ran the store until 1958, when they closed the business and renovated the building into apartments, which is still its use today.